Renting with Hertz in Miami? to the Rental Car Center in the Miami International Airport. 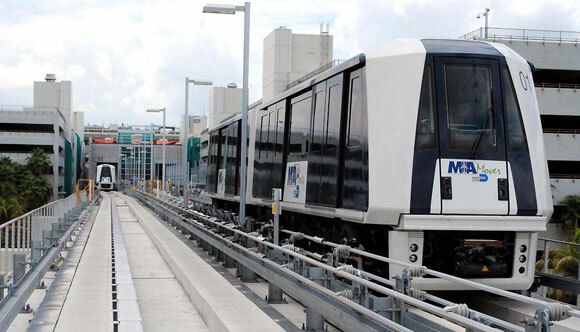 The MIA Mover will replace the Shuttle service between the airport and the RCC. • Just follow the signs to the MIA Station of the new MIA Mover (on level 3 of the main terminal - between Flamingo & Dolphin parking garages). • Get off at the MIC Station, and walk to the Hertz rental location in the Rental Car Center (RCC). • Our representatives will be ready to assist you at the Hertz counter. • And, if you are a Hertz #1 Club Gold member, go straight to your car on level 3 of the RCC. MIA Mover image courtesy of the Miami-Dade Aviation Department.